Divestiture: When we made the great leap from dial-up to DSL in 2003 or thereabouts, some friends who were making the upgrade to newfangled "wifi" gave us their old router. We drilled a series of small holes in the Castle5000 walls to run cables here and there, connecting two desktop computers to the network. 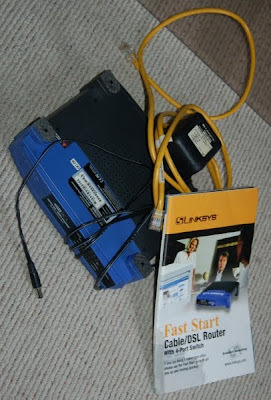 When the laptop came along, its use on the internet involved either lying on the floor next to a third cable from the router, or of course going to the coffee shop. This all worked quite well for many years, requiring only a weekly-or-so resetting of the router when it would randomly reset itself. But early this month we started experiencing glacial internet speeds that were literally reminiscent of the 1990s. We were horrified, of course. Mrs.5000 spent hours with the DSL provider's tech and sales staff, and I spent hours tediously trying to reconfigure the router by every means I could think of. 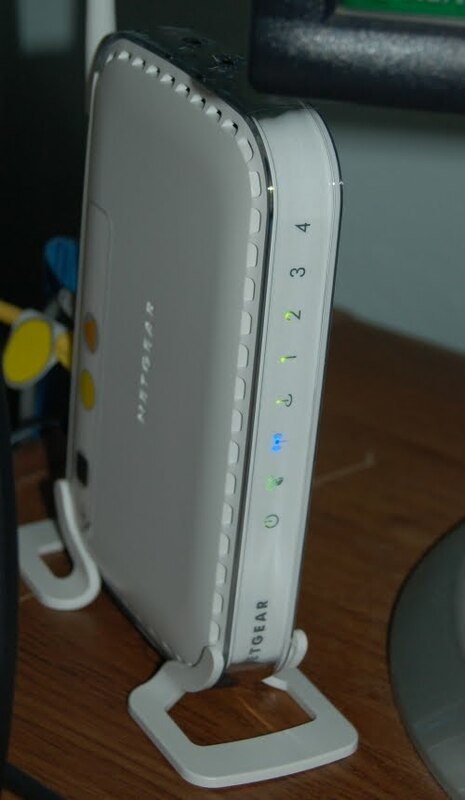 The problem just got worse, and by the end of the week we had just a single line into the house and the DSL provider offering to provide "home networking" for only an extra gouging a month. Acquisition: Finally, I went to a big box retailer of home electronics with a reputation for terrible customer service. I explained our dilemma. An affable and knowledgeable sales clerk took me immediately to a new router that fits our needs exactly. It has what strikes me as a comically tiny price tag; the sales guy assured me I didn't need anything more expensive. The transaction took maybe three minutes. So now we're back up to speed, and I can use the laptop in all sorts of exotic places throughout and near the Castle. It's really trippy. Although I think I'll still go to the coffee shop often enough. Technology has come a long way, baby!!! And was it Best Buy? It had to be. I like the way it looks like something a Tokyo schoolgirl would carry on a strap. Sometimes things come along that do make our lives easier. We have some kind of wireless thing going on here; as you can tell by my sophisticated description, I am not The Techie in the House. Rest assured that it will not compare to L&TM5000, but I hope you will swing by.